If you do not have the Victorinox key and bit accessory or it is hard to get then there are many different products out there today. The best multi-tool is always the one tool itself but sometimes a combination is needed. 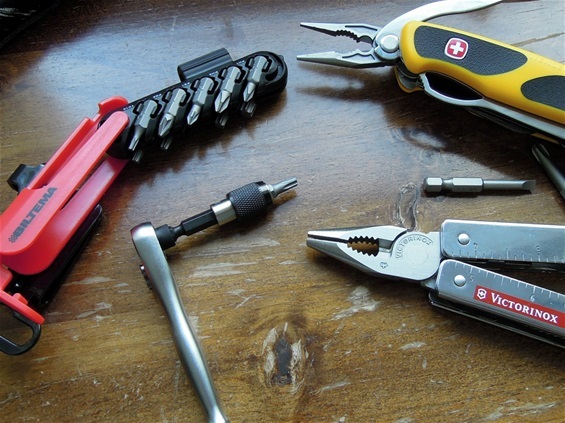 A bit driver, ratchet or key with bits can go hand in hand with a Wenger or Victorinox product. The possibilities are really incredible today. On the picture is a set with a mini ratchet and bits in a holder. This one is a product sold at the Biltema chain and it is not bad at all I must say. I am sure there are similar products in the world. This product is also magnetic and the ratchet got a switch for directions. 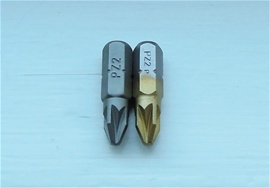 It is standard size bits so you can custom make it for any task. This is a rather low cost product so one may not expect super durability but is can do many tasks for sure. Biltema sitt sett med mini-skralle, bit-holder og bits er en artig løsning som kan brukes i kombinasjon med multiverktøy eller lommekniver. I can mention that the lenght of the bits used in the Biltema set may be just some shorter than the regular ones, or you may experience that this may vary some. On the picture you can see the Biltema one on the left. I tested the one on the right in the Biltema set and it did fit well or just enough.Tested different types and placing as well. It is really fun to do and i can see many different combinations of bits. It is mentioned S2 steel and 10 years warrantie for this set. The Ratchet can be used without the holder for standard bits and you do not have to worry about length. The speed choke and holder is magnetic and i have tested different bit makers. The lenght up to the notches are usually the same by makers of bits. It did fit other bit makers and the vary they have. The length of the bits used by Victorinox in the bit set is almost the same and i found some other that are almost the same. It should not be any problem custom making your Biltema set and finding matching ones. They must not be too long because this would make strain on the plastic holder. Good luck! The Bosch Titanium covered bits are identical or matching in length and even the nocthes or how deep they are cut. I may have mentioned this before but it is important that a tactical mind is used : When Christianity arrived in Scandinavia it represented a new religion for the believers of Odin and Thor. I do believe some was a bit more practical and had both religions. It is better to be safe than sorry. It is the same with versatile knives made and for me to be used in a kind way only. It is not so that one Brand is wrong. Any knife or versatile knife in the world can be used somehow. It is better to be safe than sorry and have one tool in each hand. Then each tool can have functions that can be used in combination with each other and to fulfill a greater picture. It is better to be safe than sorry. Take the time to read my pages on combinations tools and New Rangers with under-pages + SwissTools with under-pages. The key is to find combination tools that would take limited space and weight. You can build a pack yourself! This will help train the mind for different functions and limit the possibility to have too few possibilities. I have touched this before and i can assure that the SAK makers put together the best set of functions for the individual knives. There are a huge numbers of different knives and functions on them. Some knives could be much more into the different sports and some more pure outdoors products. It depends on the individual persons need or demands. It is for sure smart to “before-hand “looking on the individual knives and to find the one that is into your needs and philosophy. Then you already have an idea for what you need as a base. Then it smart to test it and get to know the tool and learn maintenance and care. It is also smart to have in mind what you expect others in the group may bring and if you know them individually then you know that some will probably bring the complete wrong knife and products. If you imagine this then you would become a prepared person and a safety factor. I would also imagine the need for additional bits or combination tools. 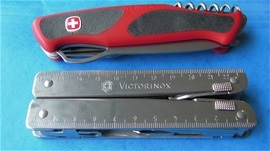 This is smart because with simple combination tools you may increase the versatile knife you carry with more than 100%. The key is to make the absolute best out of one knife with it functions but it does not hurt to build on it a bit. There are people out there that can do more with a set of functions than people would believe could be possible. Cooperation is absolutely a combination factor but then you are depended on another person. If you know the individual then you are prepared for combination tasks. Also have in mind that if one person should lose the tool what then? No matter what experts says about the correct tools to bring in the outdoors then you must not forget to learn why they recommend them. I am a person that understands the need for survival tools in a suburban mindset. I understand the needs for functions and tools that fit into the modern world, different professions and everything in between the need for professional tools. I am out in a sit on top kayak fishing or in a small boat and I jump from the islands out here. I have some different educations and I have seen the need for tools and I have followed the development to some degree on the need for different tools for work and everyday needs. I know for a fact that people must not believe that multi-tools and SAKs are knives for the outdoors in the wilderness only. It is absolutely not the case and they got that tendency to fit things in between just as well as for survival in the nature. That sad there are not many that will experience survival there but rather close to home or in the civilization. In some situations this philosophy could be incorporated into different professions and jobs. 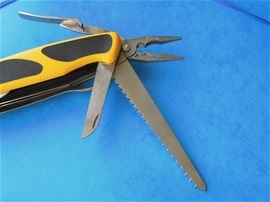 One can make a set of individual knives with functions that could benefit the performance of the companies because they could fit things in between. For sure different jobs require different professional tools but for sure a certain base of individual tools will increase the total picture. Today you can see multi-tools everywhere because every individual person that carries them understands just how fantastic they are. Not everyone understands that it is possible to increase the versatile performance with simple means. Sometimes it may happen that nobody got any tools as well. A team at work is a team that should function together just like the individual knives with functions can do. Some jobs require one knife or functions and so on. Some things are the same on average and could be used almost anywhere. Survival situations could just as well happen close to home or at work. The field of survival is special because it does not take much delay or small factors that could happen in the industry before a situation could happen. Survival may just as well be how to keep production going and perform. In today’s society everything is built on schedules and time is of the essence. The society today is becoming less versatile and forgets to incorporate everything in between that may happen. The society is becoming less versatile. Today it is not rare that people ask for a knife and nobody got one. It is not rare that people ask for a set of pliers and nobody got one or a screwdriver to turn something as simple as a screw! Come on people that is not good is it? Knives for safety in my philosophy would perform for much more that a dangerous situation. There are some laws created that is a danger towards people’s safety and comfort. We must not forget that knife ban in public areas can just as well become a safety risk! Take a look around Sakhome.com and find everything I have made about combinations and safety. If you understand survival close to people then you got an experience that could be helpful on other areas as well. Finding the best knife or tool is just the beginning. I recommend reading everything on this page as a base for my further information. I try my best to write my English so it is easy reading. At the same time it is a bit heavy philosophy and important too. I hope I can draw a smile and give nutrition to people’s interests and love of knives. 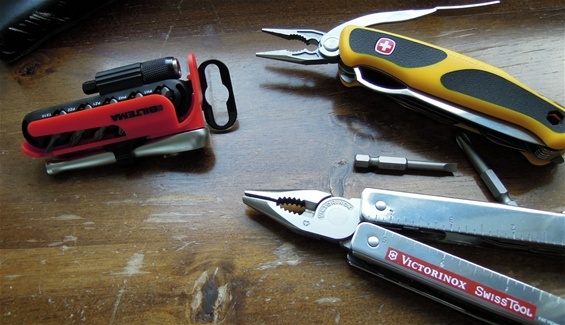 Today a multi-tool can be found anywhere and many people can use them very well. A multi-tool is today the extension of the fixed blade knife and it is an important tool for the modern world. It is all good! There is a saying that “a one punch man” is not well if that is all he got. If he is a striker then it could be very different. If you can do combinations then you are a better fighter. What I am getting at is not violence but the ability to use a tool for the exact tasks it is intended for and be able to use it for everything in between.